When you think of pear recipes, does your mind tend to wander towards, cakes, muffins, crumbles, poached pears? I know mine does. When I was contacted by Kellie from Impact Communications in regard to a competition they were holding during National Pear Month, I originally hummed and hawed about participating. The reason for taking my time to say yes was basically due to being flat out. I decided to participate, but I made the decision to push myself and come up with a savoury recipe using pears. I do have one staple savoury pear recipe I whip up on the odd occasion. Is perfect for lazy Sunday nights. A thick slice of pane di casa toasted, topped with thinly sliced prosciutto, pan seared pears, drizzled with balsamic vinegar and them finished off with shaved parmesan cheese. Sounds good, doesn’t it? It is, regard that as your bonus recipe of the day. Deciding I wasn’t going to use my good old staple recipe, I searched my brain to come up with something a little different. Marry some flavours together that I thought would work well. Guess what? The recipe I developed rocks! The filling works so well with the chicken, not over powering, and the flavours meld well together. The addition of lemon in the butter and sage sauce adds the perfect amount of acidity to cut through the rich butter and lift the dish. I really hope that you all enjoy this Belly Rumbles’ original recipe. Pre-heat over at 180 degrees Celsius. Trim and butterfly chicken fillets. Between two pieces of plastic wrap or baking paper, pound the fillets until approximately 6mm thick. Set aside while preparing filling. In a medium bowl combine pear, pecans and parmesan cheese. Season to taste with salt and pepper. Lay pounded chicken breast out and place 1/4 of the mixture on the fillet. Press the filling together slightly and bring the two long sides of your chicken together, one side over lapping the other until tight. Secure with a tooth pick. Then fold each end of the chicken over and secure again with tooth picks to make a secure parcel. Repeat with the remaining three pieces of chicken. Heat a heavy based non stick pan with 1 1/2Tolive oil. Place chicken in pan and brown well on all sides. Remove from pan and place in a lined baking tray and place in the oven to finish cooking for 15 minutes. While your chicken finishes cooking prepare the butter and sage sauce. Core and de-stem your pear, leaving the skin on. Cut you pear in to 12 wedges. In a clean pan, add 1/2T of olive oil. Once hot add pear wedges and brown either side. Remove pear from pan and set aside. Add butter to the pan and melt. Once melted add sage leaves and lemon juice. Cook over medium heat until a white foam appears. Season with salt and pepper. Add pears back to the sauce to warm through. Remove chicken from oven and remove tooth picks. 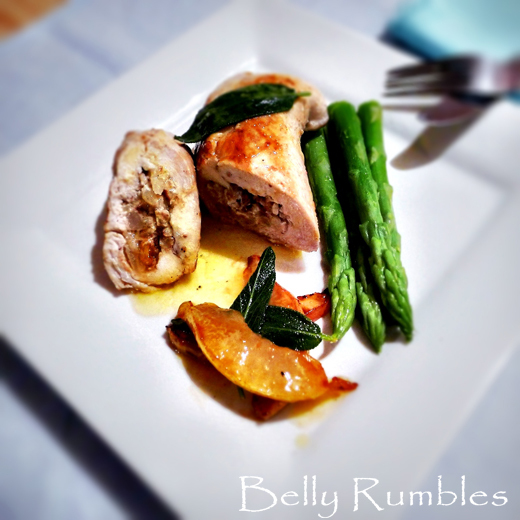 Plate chicken parcels and spoon over sauce and plate pear wedges. Serve with favourite vegetables or salad. Do tell dear Belly Rumbles reader, so you use an ingredient normally associated with a dessert or sweet recipe for a savoury one? One of the first meals I ever cooked for the husband (then boyfriend) was rolled chicken like this but stuffed with sundried tomatoes and cheese. Pear is definitely something I associate with sweet dishes but, hey, I’m always open to suggestion! Hi Phuoc, thanks dude, I was really happy with the result. Hi Martyna, I too like fruit and citrus in salads. Hi Maureen, I too like pork and apples, is a great combo. Hi Lizzy, thank you, they do marry well. Hi Rosemarie, I was really happy with the way it turned out, is a lovely dish. Hi Joey, glad you like and no problems. Awesome recipe, and great presentation, too! I often use apples in pork dishes, and sometimes oranges with lamb, beef or pork. For some reason I always forget about pears. Pears, like apples, marry nicely with meat. I love the sound of this. Beautifully done! This dish sounds so good. I love the flavour combination. I like pork with apples, onions and prunes. That looks stellar! I love a combo of sweet and savoury so this is right up my alley! Nice work. What a delicious combination of flavors! I like to use fruit in salads, raspberry or boysenberry jam with roasts and have previously served and blogged about a surf and turf steak with a vanilla bean hollandaise – it was to die for! Good luck in the comp! Looks mouth watering! Would never have thought to stuff those ingredients in chicken, good work!